One day and nearly 80 miles. 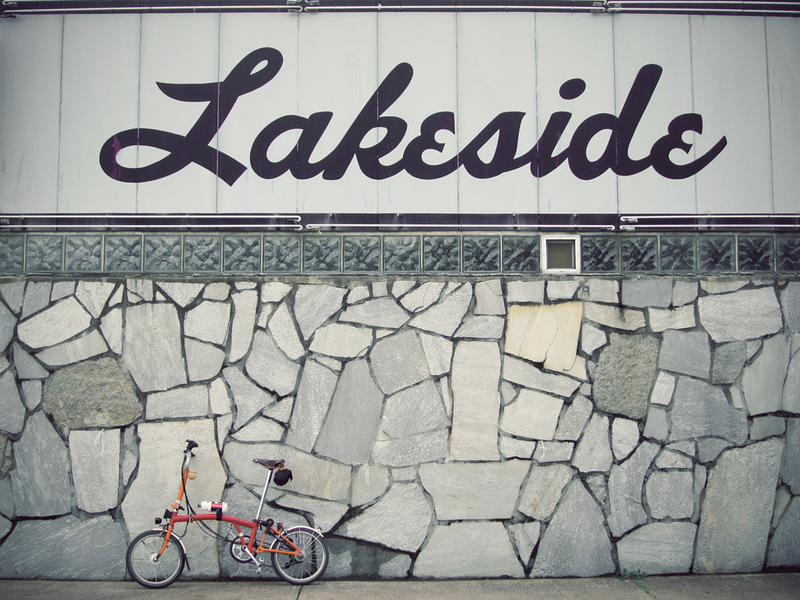 I made my first trip to Stillwater on Saturday with Tom (about 60 miles round trip), who also experienced a new adventure—his first trip to Stillwater by Brompton and his first ride to Stillwater with a riding partner. We were quite the pair in our spandex shorts and jerseys atop 16-inch wheels, very un-Brompton like you might say, given the rules of Brompton Racing. This wasn’t a day for racing, though. There were plenty of hills and lots of road to cover. On his Long Haul Trucker, Tom typically rides to Stillwater and back in under 4 hours, including a stop for a meal. Saturday was a bit different. We left somewhere around 10 a.m. after grabbing snacks and food for the week at the farmers market and dropping everything at home (that ride also factored into the day’s mileage count, along with another trip in the evening). At some point on the way there I said, “Good morning,” to a woman we were passing. Tom was quick to let me know it was in fact past 1 o’clock. I didn’t really want to know what time it was or how many miles we’d covered. I just wanted to go at my own pace. Sometimes that meant saying, “Let’s slow it down,” when feeling a bit sluggish. Other times that meant killing it on the hills, climbing out of the saddle and refusing to drop into the granny gears. Thankfully Tom is a great riding partner, matching my pace all the way. The weather was perfect: not too hot, a little breezy but not overly windy, and the trails provided a mix of sun and shade. Fixing a flat on the trail was another bonus (my previous flats had all been slow leaks IDed at home before heading out). Knowing that I can successfully remove and refit the Brompton’s 3-speed rear wheel with my road tools and patch a damaged tube in the wild was a big confidence builder. You might say I have learned a few things in my year+ at Calhoun Cycle (thanks to many lessons from Luke, Matt, and Hunter!). Prior to Saturday I’d never been further than 26 miles in one go on my Brompton. 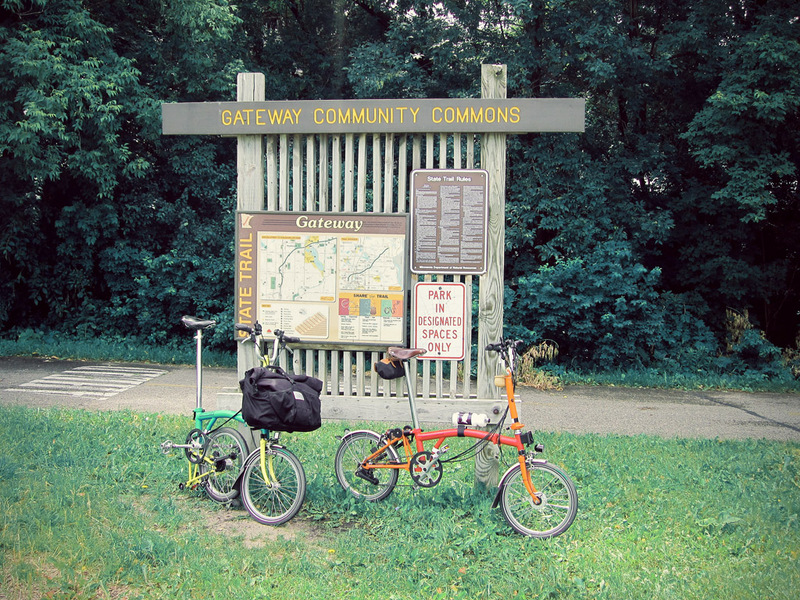 I’d never been further than 45 miles in one day, for that matter, and in that case we were riding the tandem. Part of me wonders what took me so long. And now I can’t wait to do it again. 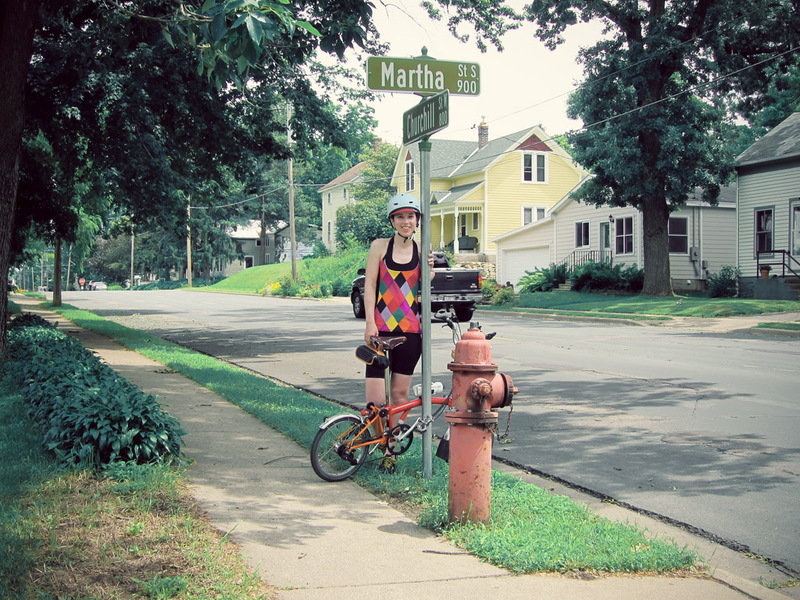 This entry was posted by Martha on Monday, July 1st, 2013 at 10:38 am and is filed under Bikes, Minneapolis. You can subscribe to responses to this entry via RSS. Martha, too cute! I’ve got to say your conclusion surprised me, though! Good luck (and obviously you can do it) with the 80 mile/day that you’re about to attempt–we’ll be thinking about all of you. Have fun!! !